Deep Eddy is just about as Austin as Austin can get! The pool is divided into two sections. There is a very large wading area that is perfect for kids and waders. There is also a deeper section (up to 8 feet) with swim lanes and a recreational area that is perfect for jumping! A concrete barrier divides the two. The water from the pool is as natural as Austin. It is pumped in from a hand-dug well and is non-chlorinated. Every over night, all of the water is pumped out of one side of the pool, the pool floor is washed and in the morning new water is pumped in! During the summer, Deep Eddy hosts Splash Nights with a family-friendly movie shown on a large blow-up movie screen. Viewers can watch from the grassy slope or lounge on a float in the pool. We had a great time, one of our boys spent most of the movie in the water, the other sat wrapped in a warm towel for the latter half. Afterwards, pumped up from a good night, we decided to make it even later by grabbing a late night pizza from Mangia, located right outside the pool! You'll want to bring floats to watch the movie, but also a blanket and/or camp chair. Hard to believe in this incredibly hot summer, but the pool can get a little cold at night, and it is nice to have a spot to dry off. The movie begins when it gets dark; around 8:50 when we were there, so it is a late night. We didn't leave until 10:30 last Saturday. Parents of young children with early bed times may want to forewarn their children if they don't expect to stay and watch the whole movie. Spots on the grassy slope begin to fill up around 7:30, so come a little early if you want to be assured of a good spot. **As of last Saturday, there is only one remaining Splash Night on August 4th - where the city is showing the movie Tangled. Check it out if you can! Today, we headed north to Round Rock to enjoy their Rock n River Aquatic Center. This is basically a pool on steroids! The park is run by the City of Round Rock, so the prices are very reasonable - $5.50 for adults, $4.50 for children, with a dollar discount for residents. For older children, one draw of the park is the two large curving slides. Children must be 48 inches or they cannot go down them (and this seems to be pretty strongly enforced). Today the line was long to ride the slides, but it seemed to go pretty quickly. There is also a nice water playground with slides and entertainment for younger children. It also has a beach area with small fountains. This is great for very small children, as they can sit comfortably in the water while moms sits close by. Yesterday we threw our bikes in the car, packed up a picnic lunch and put on our swim suits to spend the day at McKinney Falls State Park. We arrived early (around 10am), and it was still cool enough for a nice bike ride. The Onion Creek Hike and Bike trail is a three mile asphalt path around the perimeter of the park. We are not expert bikers, so this was a perfect distance for us. The trail was mostly shaded, so it wasn't too warm, and it had some nice benches to stop along the way. I have a road bike with thin tires, and I was a little nervous going over the rough spots, but on a typical hybrid or mountain bike, this trail would be absolutely no problem! After we finished our bike ride, we packed our water bottles and headed down to the Lower McKinney Falls. It is about a half mile hike to get to the lower falls from the Upper Fall parking lot. There is a hidden path to the right of the lower falls to get down to the "beach" area at the bottom of the falls. The boys had a wonderful time digging in the rocks, catching frogs and attempting to catch the huge pollywogs. After about an hour, we packed up to go. Although on previous visits we have taken the long hike around the homestead, we were hungry and hot, and decided instead to head back to the car for lunch. But if you've never taken the homestead trail, on a cooler day, it is very pretty! Right above the upper falls are some nice shaded picnic tables that were perfect for lunch. After we ate, we traipsed across the falls and down to the beach area of the Upper Falls, where we hung out for another hour or so. Some thoughts and tips: Right now both falls are just a trickle, but the water is still moving. Due to the warm water and drought, I have made the rule that the boys can get in the water up to their chin, but they cannot get their head wet (meningitis is just scary!). The park takes a water sample every week, and as of this week, the bacteria levels are within safe levels, but it never hurts to be careful! 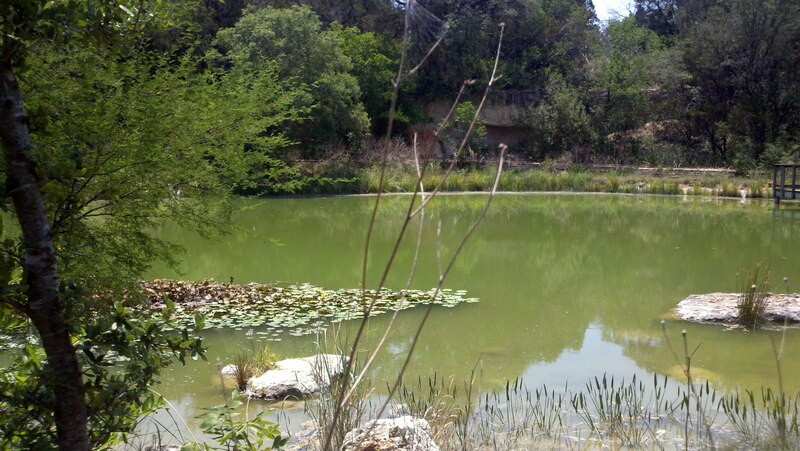 Also, we did not bring our fishing gear, but there are some nice fishing spots along the Onion Creek Trail. Next time, we will be sure to bring our rods! Definitely bring lunch and lots of water. The hike down to the lower falls is short enough that a backpack with lunch supplies wouldn't be too cumbersome. Finally, there is a nice visitor center near the Upper Falls parking lot. The center is closed mid-week, but on previous visits we have stopped in and had a good time. For our most recent outing, the boys chose to spend the morning playing mini-golf, followed by an outing to a sprinkler park. And for mini-golf, our favorite location is Peter Pan mini golf just south of the river. How can you not love a place that has been around for 65 years? Peter Pan is just about as old school as it gets. There are no electronic moving parts, it doesn't glow in the dark, there are no light-up obstacles, but it is still lots of fun. It's two 18-hole courses have a collection of fairy tale characters, a loop-de-loop and a huge dinosaur to putt under. We've been coming here for a number of years and we were pleased to see it had recently gotten a new face-lift. All of the obstacles have received bright new paint jobs. And we weren't quite sure, but it seemed like even some of the obstacles were different than last year? Each course takes about an hour to complete, and you can choose whether you want to do just one or both (with a discount on the second). And after the completion of the course, Peter Pan offers snowcones for a dollar a cone! Pretty awesome! It has been our tradition to head over to Butler Park after we finished both courses... But since the boys and I have already been to Butler Park a number of times this year, we decided to try something new. I haven't been to Pease Park in years, but I had recently read that the park had a new splash pad, so I thought we'd check it out. As we pulled up, I saw the small concrete pad and limited number of fountains and was a little worried. This clearly was a park for younger children. I figured we'd eat our picnic lunch, pack up and try a new location. But after arriving, the kids really wanted to get wet. So I let them play for a bit. And as often happens, 'a bit' turned into an hour. Then they wanted to climb down to the creek bed below the splash pad. There they spent another hour catching frogs, minnows and feeding the birds bread. We then checked out the playground for half an hour or so. The playground was nicely divided with a section for younger children and one for older. And it had one of the largest collection of swings that we've seen in awhile. The kids' attention was then drawn to a group of older men who were playing an unfamilar game. It turns out they were from the French Legation and they were playing Patanque - a game that seemed (to me) similar to horseshoes. Peter Pan Tips and thoughts: We always try to get to Peter Pan early, as the course gets uncomfortably hot in the afternoon. As another option, they are open late, and you can play after the sun has gone done. If you are only going to do one 18-hole course, the west course is more challenging than the east course. KGSR's Blues on the Green may be in their 21st year, but this was our first time going. We arrived downtown around 7pm, but traffic was so heavy that it took us twenty minutes to get into the park. We parked in the grass lot right under the Mopac bridge for $3. The music had already started by the time we had collected our stuff and started walking toward the stage, but finding a place to sit was no problem. We enjoyed the drop of evening while listening to the music and eating from the trailers along the side. They had a wide selection of food: Salt Lick, Kirby Lane, Burgers, Gatti's pizza and the prices were really pretty reasonable. My kids' favorite was the frozen bananas! Tips and thoughts: The web site says you can bring two factory sealed bottles of water with you. In reality, you can bring just about anything you want. I saw people rolling along huge coolers filled with every assortment of food and drink. Parking is a bit far from the park, so make whatever you bring portable. If you have kids, bring a ball or frisbee - light-up ones if you can find them! Towards the back, the music is not as loud, and there is room for them to run and play. And definitely bring a blanket or chairs to sit on the grass. But most of all, if you are hesitant about going (like I was), I suggest just trying it out. Since the concert is free and the parking fee minimal, you can go for an hour, try it out, and leave whenever the family is ready! The only other time I have been to Decker lake was for a triathlon a few years ago. Then, I hadn't really been focused on the fishing :o) So this was a sort of new place for us! Overall, the lake isn't incredibly pretty. It has a left and right wing, with picnic tables and shore access to the lake and in the main area there is a boating dock and fishing pier. I didn't notice any restrooms. From previous experience I know that the area around this lake (skirting the exterior of the park) is very nice for bike riding. The roads are wide and there is a very little traffic. There is a nice ten or so mile route around the lake that is scenic and enjoyable. While the lake touts that swimming is available, the shallow mud would make for a pretty squishy wade, and I'm not sure it would be my top pick of swimming holes. Overall, I'd say this lake is a nice place to fish, bike ride or boat, but I don't know that I'll be adding it to my top 50 list!. This park was a new discovery for us. I really can't believe we haven't been here before. The park is a 2 acre estate that was granted to the city in 1971. The preserve is 21 acres of hiking trails connected to the park. Within the park walls is an amazing amount of manicured ponds and trails with all sorts of birds and wildlife, and, of course, peacocks. There were at least six male peacocks, resplendent in all of their beauty, and about as many hens (still beautiful), and we even saw two chicks. There were also ponds chock full of lilly pads, flowers, and turtles. The boys spent at least forty five minutes just exploring the park, and watching the birds. We then headed to the preserve and hiked the trails. The western trail led down to a sliver of Lake Austin. The eastern trail led to a small creek, where the kids merrily spent at least thirty minutes catching and releasing teeny tiny frogs. The trail then led over the creek to an upper area with small caves that they loved climbing into and around. Unfortunately, we then had to leave due to hunger. I hadn't realized we would enjoy this place so much, and hadn't packed a lunch. We will definitely be back here again - and next time we'll bring lunch! 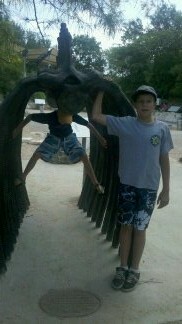 One of our all-time favorite places to go is the Austin Nature Center. We have been going there a couple of times a year since D was a toddler. Located in downtown Austin, but with the feeling of being away from it all, this place has it all: animals, dinosaur bones, hiking trails, a nature center and more. Perfect for boys. And free, except for a small donation! But in the last ten years, we have probably gone here at least 30 times; already explored every nook and cranny. So I was curious, when I gave the boys our potential list and asked them to pick their top favorites, if this one would get selected, or if they had finally outgrown it. When I received back their lists, filled with circles and stars, I was pleased to see it still got starred by both boys :o) We have already gone twice this year, once in the early summer, and again when my brother was visiting. Currently, the boys' favorite activity at the Nature Center is the Trade Counter - open every Wednesday through Saturday. The basics of the trade counter is that the boys can bring in any manner of natural item: leaves, shells and most especially, bones they have collected during our hikes. There is a naturalist there (an amazingly patient woman) who works with the kids to help them identify the items, and then awards points. These points can then be used to trade for other items. Just this summer, we have identified a mayfly carcass, a coyote femur, a cow bone (not brought in by us), a deer mandible, churt and some leaves. Also at the Nature Center is a collection of live bees. Some time last year, the queen swarmed, and the case sat empty for a couple of months, but they have recently refilled the case with new bees. Every visit, we search to find the queen bee (identified with a white dot). After spending quite a bit of time in the Nature Center (and exploring all sorts of odd things), we usually briefly dig through the dino pit, walk around the fish pond, swing by the animals, small wonders and bird of prey, and then head to the back area for a nice hike. 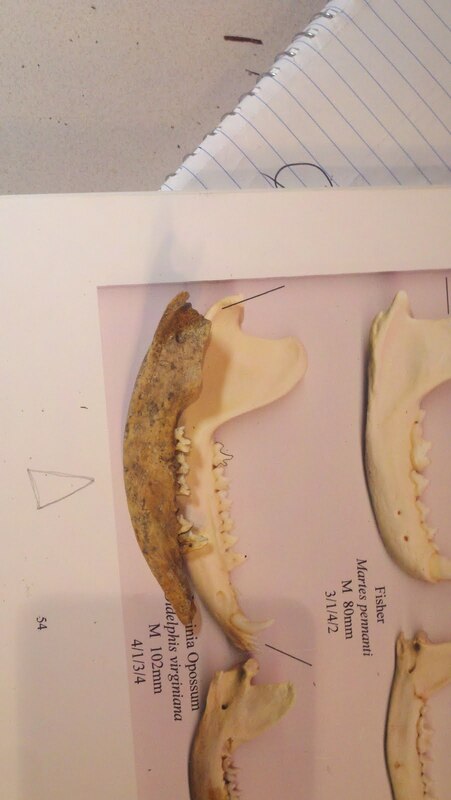 There isn't a whole lot new to us; we know the name of the pacing coyote (Martha), and how many barn owls they have. We know the way to the really cool hike that gives a great view of Austin, as well as the lower trail, that allows you to hike up a cliff side on the way back. We know that the bats outside the Natural Wonders aren't real. And the location of most of the bones in the dino pit. We even knew when the bees had swarmed from the hive - and were thrilled to see they had brought in a new one just days ago. Last night, the Austin Astronomical Society and Friends of Austin Plantetarium hosted their bi-annual Austin Under the Stars event at St. Stephen's school. This was, by far, one of the coolest things we have done all summer! Between twenty and thirty amateur astronomers brought out their scopes to share with the public in this completely free event. And while all those involved may be amateurs and hobbiests, the event was top-notch. The astronmers were well-informed, helpful and patient. The event was extremely well set up and organized. We arrived at the start of the event for some solar viewing. AAS handed out special sunglasses that allowed the kids to look directly at the sun. Ten or so astronomers had fitted their telescopes with a special filter that allowed viewers to look directly at the sun. We see the sun everyday, but today we got to see it in an entirely new light... with sun spots and solar flares that were miles in height! A scale model of the solar system. AAS had also set up a scale model of the solar system, with balls of varying shapes to indicate the size of each of the planets. We found Earth first (recongnizable by its rotating moon), and then found Mercury, Venus and even Mars. But where was Jupiter? Waaay out in center field of the nearby ballfield. We, of course, had to run out to inspect Jupiter, and then returned to find the remaining planets. It gave the kids a great sense of how large the solar system is, and how small we are in it! We then headed inside the gymnasium where the Austin Planetarium had set up their mobile planetarium. We were given a fifteen minute discussion on some of the basic constellations (just perfect in length for children), and then they showed some movie clips on their circular screen. When we returned outside, there was a lull in the events. The sun had set, so there was no longer any solar viewing, but the North Star had not come out yet (required for most astronomers to calibrate their scopes). So the kids just played in the field for a bit. Around 9 o'clock the stars started to appear, and in another ten minutes most of the astronomers had calibrated their scopes and found something amazing to show us. We saw the Double double star - two stars close together, that, when viewed, you realize are actual two pairs of double stars. We saw Saturn, which is always amazing because it looks, well, just like you expect Saturn to look like from photos - but there it is in real life! Probably the coolest thing we saw was the ring nebula, which was sort of small and dark, but when you learned what you were looking at, and how far away it was, was *really* cool. AAS had set up a passport program, listing twelve items for the kids to find. Kids who found all twelve could put their name in a bucket to participate in a random drawing for a telescope. The kids enjoyed looking through all of the different scopes, talking to the astronomers, and getting their passports signed. Unfortunately, it was past 10pm when the yawns indicated we had to go. We had only found about six of the items, but the astronomers very kindly congratulated us on what we found, and allowed the kids to enter their names anyway. Overall, this event was totally amazing, both in what we go to see, and how well organized it was. I think this event will continue to top our Top 50 list! Having lived in Austin for twenty years, I have seen the bats many, many times. Whenever anyone visits from out of town between the months of April and August, we have to spend an evening watching them come out. So, with my brother in town, this was a definite event! The history of the bats, as I understand it, is that Austin has always had bats, and maybe even slightly more than our fair share. But in the 80s, renovations on the Congress Street Bridge made the ideal nesting place for these flying mammals. Since then, Austin has become the proud host of the largest urban bat colony in North America! The bats are visible at dusk when they emerge from under the bridge to spend the night catching small bugs. Check a local weather station for the time of sun down, and plan to arrive a half an hour or so before then. The bats are visible from March until November, though the best viewing time is in August. Along the southern portion of the Congress Street Bridge (305 South Congress Ave, 78704). I believe the Austin American Stateman is still offering parking in their lot for $5. This is located right along the river where the bats emerge. Bring a blanket or chairs to sit on the eastern hillside near the Austin American Statesman or stand on the bridge and watch from the road above. You can also take any number of water cruises who will hang out under the bridge until the bats arrive. Lone Star Riverboat Cruises and Capitol Cruises are two options, though there are many more. How long to plan for? The hillside, bridge and even river fill up to watch the show! Fortunately for my visit when my brother was in town, the night was one of the most spectactular shows that I have ever seen. Tips and thoughts: If you come early, parking is free in the Statesman parking lot. Once that fills, the Statesman seems to be selling out the employee parking for $5. There is also lots of free parking at the Texas One Building which is just a short walk from the bats. You can view the bats from above or below (or even by boat). We usually bring a blanket and hang out on the grass below. When we went, we arrived around 8:15pm, waited for about 15 minutes, and then the bats appeared. The time changes based on the time of year, however. Tonight, the bats took at least a half hour to come out and created a huge line into the distance, as far as the eye could see!